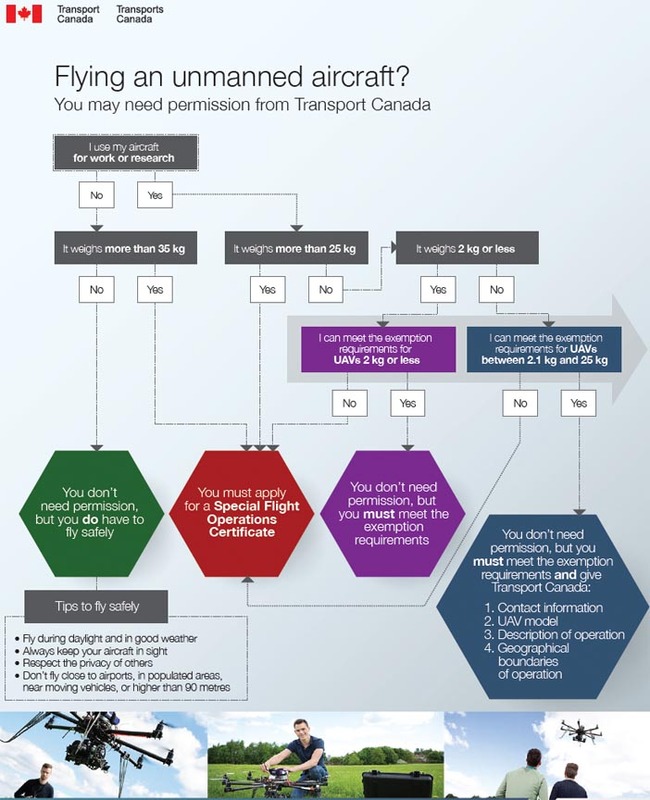 Canada Eases Rules for Commercial Unmanned Flights; UAV Mischief Mounts in U.S.
Canada has lifted a key filing requirement on professional drone operators, allowing firms flying small, unmanned aerial vehicles (UAVs) to conduct for-profit flights without prior approval as long as they follow a lengthy set of rules and obtain insurance. In October, Lisa Raitt, Minister of Transport, launched the Government of Canada’s safety awareness campaign for UAVs or drones. The national campaign is designed to help ensure UAV users—both recreational and commercial—understand the rules of the skies and always think safety first. This is a markedly different approach from that in the United States, which has largely banned for-profit flights until rules can be set up to safely integrate UAS into the national airspace — a multi-year process. Impatient U.S. entrepreneurs and their advocates are demanding more opportunities, stressing the safety of UAV operations and pointing to the experiences of Canada and other nations as examples. “We think [the Canadian approach] is a step forward,” said Mario Mairena, senior government relations manager for the Association for Unmanned Vehicle Systems International. American proponents, however, are facing mounting reports of near collisions and unsafe operations by unregulated drone hobbyists and rogue commercial operators. Data released November 26 by the Federal Aviaition Administration (FAA) in response to requests from the New York Times, the Washington Post, and other news media, detailed nearly 200 drone-related incidents, including close encounters with piloted aircraft and flights through restricted airspace and over populated areas. Canada is counting new rules and operators’ common sense to keep risks low. Aircraft must fly at 87 knots or less and the flights must take place away from populated areas or controlled airspace including, for example, the skies around airports and forest fires. The aircraft always must be within the visual line of sight of the operator at all times — a requirement similar to that being discussed in United States for small UAVs. Operators also must have completed ground school, be at least 18 years old, in good health and, specifically, be sober and unimpaired by drugs while operating unmanned aircraft. Although enforcement could potentially become an issue for Canada as operations ramp up, one mandate may help sort out the less conscientious operators — the requirement to obtain $100,000 worth of liability insurance. An operator must not only obtain coverage but must be able to produce proof of their policy on demand while they are operating a UAV. One of the groups not covered by Canada’s more open rules is foreign companies; non-Canadian firms must still apply for a Special Flight Operations Certificate. Though UAS companies might consider partnering with firms north of the border or moving their operations to Canada as a way to get started, McKinnon suggested that the Canadian market is already sufficiently established that it might not be easy to get a foothold. The answer to the frustration, suggested Mairena is to move more quickly to integrate unmanned aircraft into American skies. “We want to see the integration of UAS proceed without any further delays so we can have an established framework for UAS operations in the United States,” he said. An unwillingness to wait for the framework and/or ignorance of the current ban and safe flight procedures appear to be at the heart of the nearly 200 incidents reported to the FAA this year between February 22 and November 11. Flights over and around stadiums appear to have been popular since the start of football season with half a dozen incidents, including a case at the Daytona Beach Municipal Stadium where a drone stuck and slightly injured someone. Unmanned aerial vehicles (UAVs) were repeatedly observed operating near or even at airports, including one situation in Joplin, Missouri, where the airport managers appeared unaware such flights were illegal. In another case a UAV crashed not far from Dallas’ Love Field Airport. The most alarming incidents, however, were those in which pilots of aircraft reported seeing UAVs flying in their airspace thousands of feet above ground. In October a pilot flying at 4,800 feet was forced to take evasive action when a UAV came within 10 to 20 feet of his plane while he was flying near Tinker Air Force Base in Oklahoma. A month earlier another pilot encountered five remote controlled gliders operating near Visalia, California, while flying at 1,500 feet. A Cessna pilot reported encountering a UAV when flying at 2,000 feet over Honolulu in July. That unmanned aircraft came within 50 to 75 feet of the Cessna’s wing. In addition to the widely reported sightings of drones near JFK airport in New York, a New York Police pilot told aviation officials a fast moving UAV came within 800 ft. of his helicopter. In that case the UAV pilot was located, the drone confiscated, and charges may be filed. Many more such near accidents may well have occurred. The list is not considered comprehensive, according to the New York Times, because some incidents would have been reported to local officials or not at all.